A giant inflatable moon caused havoc on the streets of a Chinese city - squishing cars, pedestrians and motorcyclists. 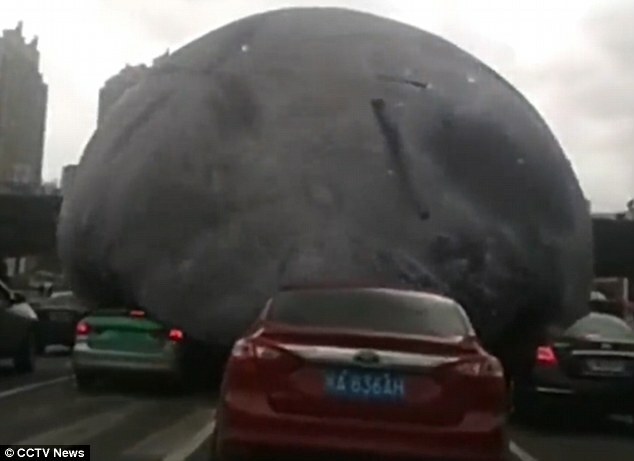 The slightly deflated celestial blob rolled along a motorway in Fuzhou, Fujian province, taking up a whole two lanes with its bulk. The moon begun its reign of terror after typhoon winds detached it from the festival float it had been anchored to. 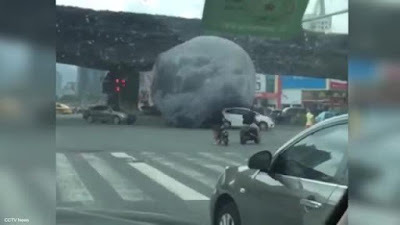 Footage taken on Wednesday shows the floppy object rolling towards two motorcycle riders, one of whom dodges out of the way at the last second.The blow-up planet then lurched onto a construction site, gradually gaining momentum in the high winds.